About the one thing which seemed consistent for the Wisconsin Badgers this season was their inconsistency. Yes, the Badgers finished 23-10 and earned a 5 seed in the NCAA tournament, but it was a roller coaster of a year. Wisconsin started out 5-0 but then went 6-5 over its next 11 games. The Badgers followed that with a six-game win streak, but lost three of their next five. A four-game winning streak at the end of the season was halted in the Big Ten semifinals. 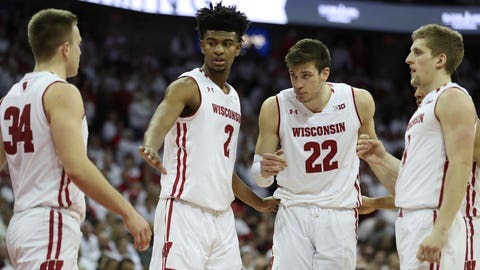 Wisconsin had trouble on the offensive end all season — scoring, shooting and rebounding — with its defense often carrying the way. Advanced stats bear this out. We’ll take a look at six advanced stats in particular here: Points per possession, opponent points per possession, effective field-goal percentage (which gives more weight to 3-point makes), offensive rebounding percentage, defensive rebounding percentage and turnover percentage. With the rebounding percentage, this is more helpful than just looking at the raw numbers. For example, in Wisconsin’s loss to Michigan State in the Big Ten semifinals, the Badgers had more offensive rebounds than the Spartans — 10-8 — but MSU got a higher percentage of the possible rebounds than the UW on the respective offensive ends (28.6-21.7). The good news for the Badgers is Oregon, their first-round NCAA tournament opponent, is middle-of-the-pack in defensive rebounding percentage. And the Ducks, like Wisconsin, aren’t a good shooting team (either are potential second-round opponents Kansas State and UC Irvine). Wisconsin holds a distinct advantage over Oregon, Kansas State and UC Irvine in one category — turnover percentage. You might be surprised to hear this especially after the game against Nebraska in the Big Ten tournament, but the Badgers took care of the ball as well as nearly almost every team in the country. If you’re wondering how this compares to previous Wisconsin teams, here’s the advanced stats from the past four seasons, which includes the national championship runner-up, two Sweet 16 teams and last year’s postseason-less squad. If you want to see trends, below is the advanced stats from every Wisconsin game this season. When it comes to scoring and shooting, the struggle is real. The Badgers have had a points per possession of 1.000 or greater just twice in their last 11 games (and are 7-4 in those contests). They’ve also eclipsed 50 percent effective field-goal percentage just twice in that span. But defensively, Wisconsin has rattled off six straight games holding opponents to under a 1.000 PPP (4-2 record, with one loss in double overtime) and in the last 16 games have allowed over 1.000 PPP just three times.